INTERVIEW: Karen Casey is the author of Cultivating Hope: Weekly Readings to Open Your Heart and Mind, published by Hazelden, October 2009. Her first book, Each Day a New Beginning: Daily Meditations for Women, has sold more than three million copies. AVAILABILITY: Available for interview nationwide by telephone. Travel by arrangement. Best-selling author Karen Casey offers a year-long program to guide us in opening ourselves to the awesome power of hope. It is hope --the ability to push past fear and open our minds to new possibilities-- that empowers us to bring about positive change in our lives. Yet, amidst personal tragedy and the turmoil of world events, many of us struggle to sustain a sense of hope for tomorrow. In Cultivating Hope, spiritual leader, and recovery expert, Karen Casey reveals everyday ways that we can open our hearts and minds to the awesome power of hope. For each week of the year, she offers a guiding principle with an accompanying essay that, if studied and explored, can help each of us achieve inner peace and a positive outlook. Themes include how we can heal through the expression of love, gain a fresh out look by striving to understand our anger, and free ourselves of constraint by letting go of judgment. By allowing Casey's principles, insights, and personal stories to penetrate our thoughts and inform our habits, we gain the perspective and strength to turn away from fear and open ourselves and our communities to a future filled with potential and positive change. Karen Casey, Ph.D., has spoken on spirituality, relationships, and personal growth for more than twenty years. She is the author of twenty books devoted to the enhancement of one's personal and spiritual journey. Her first book, Each Day a New Beginning: Daily Meditations for Women, has sold more than three million copies. 1. What prompted you to write Cultivating Hope? 2. Hope seems like such a nebulous topic. Can you clarify it for us? 3. What is it about hope that matters so much that you decided to write about it? 4. Your path as a writer goes back to 1982. What got you started? 5. Will you elaborate about your own recovery for our readers/listeners? 6. Would you say you were ever hopeless? How did that "look?" 7. What advice could you give to the person who is feeling hopeless about his/her future? 8. Are there some specific activities a person can do to cultivate "hope?" 9. In closing, is there one, simple thing a person can do right now to cultivate more hope? 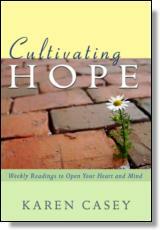 Cultivating Hope: Weekly Readings to Open Your Heart and Mind by Karen Casey. 50 Quiet Miracles That Changed Lives by William G. Borchert. Inspiring true stories of ordinary people who have experienced extraordinary miracles, their Higher Power pointing them in a new direction, forever changing the course of their lives. Spirituality/ Addiction/ Recovery. Taking Back Your Life: Women and Problem Gambling by Diane Rae Davis. Up-to-date, guided support to help women with a gambling problem achieve the rewards of a hopeful life that's free of addiction.